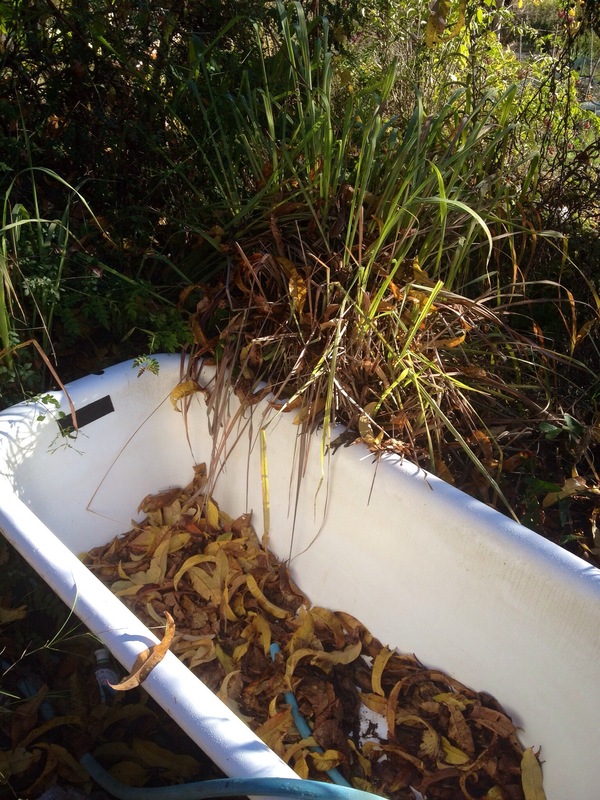 Our bathtub is full every day in summer, but now all there is inside it is a bunch of peach leaves. There is snow on the mountaintops and the temperatures in the garden have dropped to a cool 40 F in the sun. This may sound warm, but the lemongrass doesn’t think so! It’s that sad looking mess by the tub. Luckily we have a few other clumps, one of which is still very green, so I cut some for winter. Ali cut the leaves into smaller sections and put them in paper bags to dry. That way, we’ll have lemongrass tea all winter! I just had an interesting tea made with dried lemongrass and little chunks of dried ginger. It was really tasty, and the fact that it was dried ginger gave it a mellow, almost caramel flavour. I’ll be trying to replicate it! 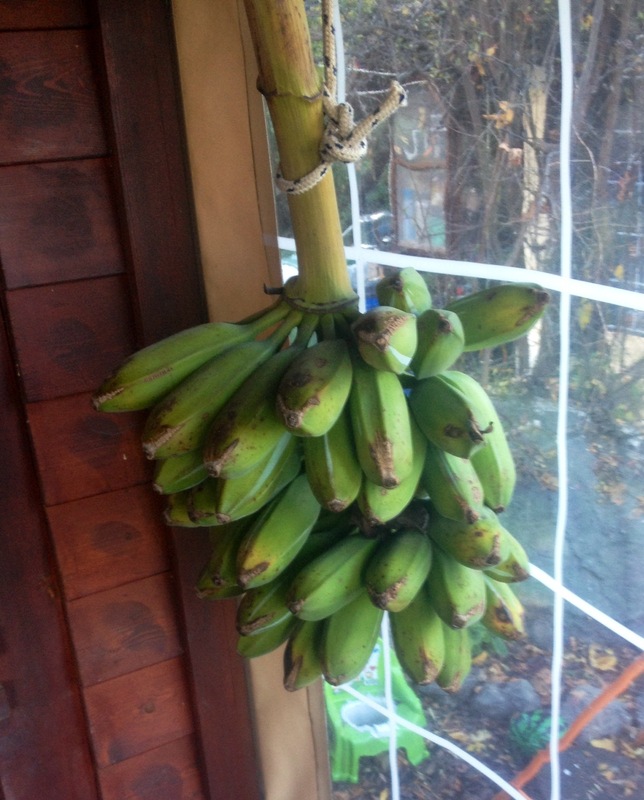 We also cut down the remaining bananas off the tree. We’d been eating them as they ripened, but figured that they were no more likely to ripen in this weather than they would be in the fridge. I took a bunch to the apartment to ripen and eat there. We’ve even moved avocados from the kitchen to the bookshelf indoors where we sleep because it’s too cold for them to ripen out there (an outdoor kitchen is a mixed blessing in winter…). They are bought not picked, unfortunately, but it is the height of the season here and there are tables of avocados for sale at the vegetable markets these days. Nothing could make me happier, as I adore avocados (and they are ideal roommates). Wow – you do grow the most exciting things…we need to get a bit more adventurous! Good looking bunch of banana you got there. How lucky to be able to eat them as they ripened. They are very tasty and quite different from the commercial ones, even the locally grown ones. They are very dense and have a custardy flavor. I wish I knew what variety they are! I have this notion that you and I are gardening in similar climates, so running on that assumption, I am sure that lemongrass would love it there. Personally,I was amazed to get bananas at all because, even at only 500 m elevation, we get much lower temps than at sea level. It must be a pretty determined old thing! Baki would be delighted to harvest some snow. It is a constant source of regret to him that we only see it from afar on the mountaintops. 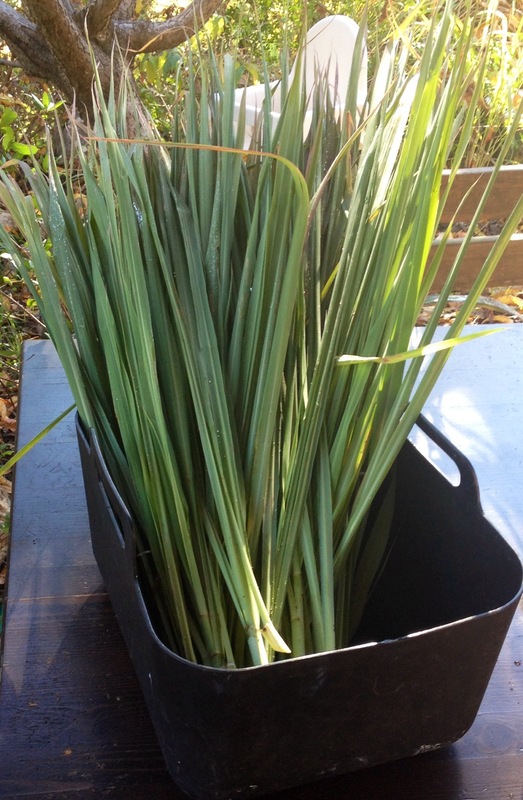 I used to grow lemongrass when we lived in Florida and I have tried growing it in New England but it is just too cold here. My mother grew it in Istanbul but had to bring it indoors to overwinter. It doesn’t like the cold!